My first thought was that I probably hadn’t burnished the labels down well enough. Burnishing can make a huge difference when working with adhesives and is something easy to forget or to not do thoroughly enough. So I used my fingers to rub over the surface of the labels, giving special attention to the edges. Then I closed the door and went to do something else. I checked on them about fifteen minutes later than the darn things were curling again. Hmmmm. This closet is right next to the kitchen so I grabbed a spoon and used that to burnish down the problem labels. Fifteen minutes later and they were curling again, although not as dramatically. 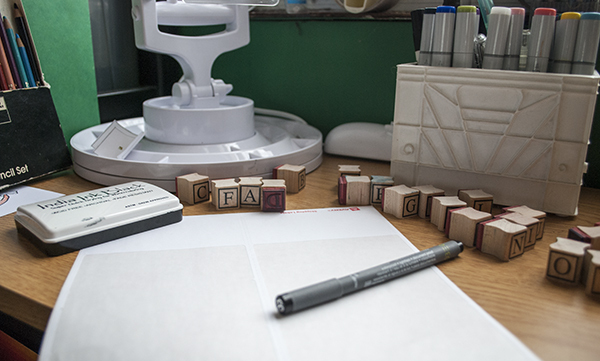 So then I did what I should have done to begin with — I went into my craft supplies, pulled out my bone folder and used THAT to burnish down the labels. I used the flat side of the bone folder across the entire label . . .
. . . and then turned it to use the bone folder edges back and forth over the edges of the label to really press them down. This seems to be doing the trick . . . so far at least. I thought it was interesting that the labels worked well on some boxes and not so well on others. All of the boxes were cardboard. The labels were all Avery pressure sensitive labels for use in laser printers although some were full sheet (8 1/2″ x 11″) and others were 2″ x 4″ pre-cut labels.) The label cut from the full sheet was stuck to a colorfully printed product box and stuck nicely. 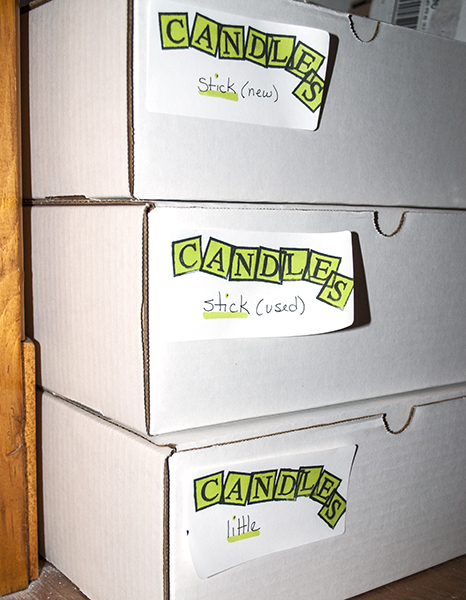 The 2″ x 4″ labels that were stuck to run of the mill uncoated brown cardboard boxes were fine too. It was the 2″ x 4″ labels that were put on the sides of white shipping boxes that wanted to peel up. Ironic don’t you think? So why do these things curl like this? It did some poking around online and actually found a lot of people complaining about Avery labels not sticking. But there are also people who say they stick just fine. So what is going on? While it is always possible that someone might get labels with a bad batch of adhesive, it’s probably most likely that the answer is how the labels are being put to use. This type of label is pressure sensitive. That means that the adhesive is activated by pressure (as opposed to something else like heat or moisture.) Usually when you attach a shipping label to something, you smooth it down with your hand so you are attaching it with light pressure. But for some surfaces and in some environments, that may not be enough. Sometimes you need to really burnish it down to make sure you have thoroughly activated the adhesive. Here is an interesting post on using bone for burnishing: Pressure Sensitive Adhesives & Burnishing. Other factors can come into play as well. One thing that can get in the way of an adhesive sticking correctly is dust or other particles, grease or oil, or some other material on the surface that resists the adhesive. If you try to use labels in a dusty environment, they may not stick well. I suspect that a combination of dust and not enough burnishing may have been my problem with my curling labels. Although the boxes looked fresh and clean, I probably should have wiped them with a dry dust cloth to be sure. Another interesting factor is moisture. If your environment is damp, or your boxes have a high moisture content, that could affect adhesion. We’ve got freezing rain here today, but because most of the labels stuck fine, I don’t think that caused the problem this time. Then again, how you store your labels can make a difference. You need to keep them in their original packaging and in a cool dry place. Mine were stored correctly, although I’ve had this particular box of labels for years. One thing I saw mentioned a few times as I poked around online is that how you peel the label off the backing sheet can make a difference. 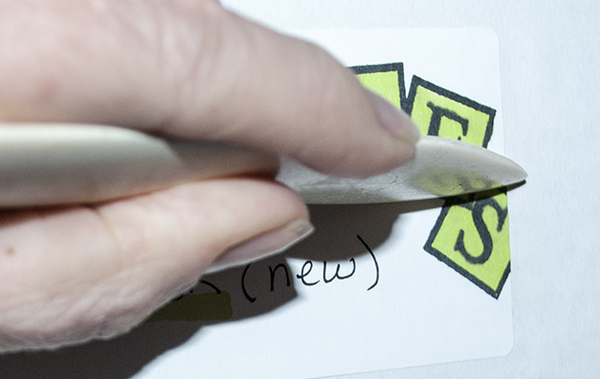 One online post called this “picker’s curl”, asserting that if you pull labels off a backing sheet from the sides (for example, from left to right), you are encouraging the label to curl, but if you pull the label off the sheet from the top of the label to the bottom, they are less likely to curl. (Are You or Your Labels Suffering From Pickers Curl?) Another site suggests taking the backing away from the label (instead of pulling the label off the backing), citing the same thing — that when you pull a label off a backing sheet, it creates a “memory curl” and will be more likely to curl on your surface. (World Label Help Using Our Products.) So next time I’m working with labels, I’ll be sure to try peeling the backing off the label instead of the other way around. It’s peel the back off from the label from now on for me! Thanks Nancie!!!! That is very interesting! I particularly have problems with file folder labels, but I’m guessing that the surface isn’t very clean. Since I only use a label on “used” folders, I’m going to have to be more careful. Thanks for the tips.